On this two dollar clothing sale day the thrift store was jammed. I sidestepped a woman pushing a loaded shopping cart and bumped into a colorful display rack of scarves and hats. One scarf caught my eye with its unusual design of ice skaters in 18th-century costumes. At first glance it somehow looked French to me. As I carefully unfolded it, I saw two words in the middle of the design: “Joies d’Hiver”: Joys of Winter. Two more words at the bottom of the scarf made me catch my breath: “Hermès Paris.” A white care tag in French and English proclaimed that this item was made in France of 100% silk. I carefully examined the scarf for stains, rips, holes, snags, hanging threads and other imperfections. I found absolutely none. It was in excellent condition. The hand-rolled reverse hem was perfectly stitched on all four sides in matching colored thread. Obviously this scarf had never been worn. “It’s probably fake”, I thought. Taking my find home posthaste, I googled my way through an assortment of web sites, acquiring a crash course on Hermès scarves in the process. I already knew that they were, like the Rolex and the Rolls Royce, iconic status symbols. Queen Elizabeth has been filmed and photographed wearing her extensive collection of Hermès scarves while walking her Corgis or sipping tea in the royal family’s private quarters at Buckingham Palace. 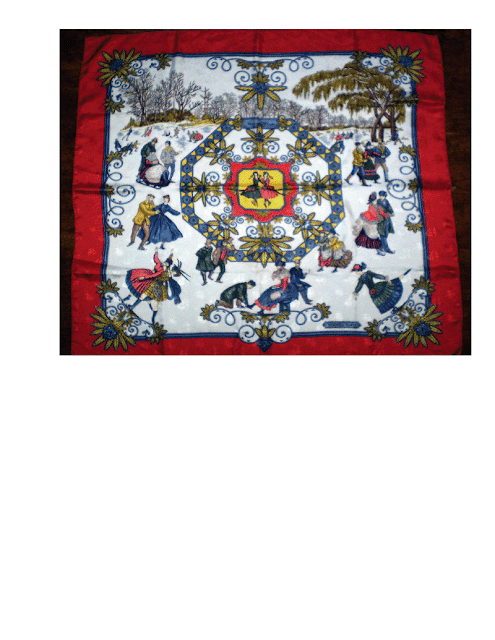 Hermès scarf designs vary greatly in motif and color and are often re-issued. Artists submit new creations to the House every six months. From an artist’s sketchpad to the final inspection can take as long as two years and include as many as 40 artisans. No wonder retail value for this luxury accessory currently averages around $450. “Joies d’Hiver” was designed by the artist Joachim Metz and issued in 1992-93 in several color combinations. E-Bay does not currently offer this particular scarf for sale, which according to several websites is considered one of the most popular and sought-after Hermès designs. I discovered next that my scarf was printed onto silk jacquard, a unique process invented by the Frenchman Joseph Marie Jacquard in 1801. The Jacquard technique weaves into silk fabric a small, slightly raised repeat design, which on my scarf is a miniature skating couple. Re-issues of “Joies d’Hiver” were printed on plain silk twill instead of jacquard, making my find even more valuable. Although I’ve had offers, I don’t intend to sell or wear my treasure. How could any amount of money equal the rush of pleasure I experience every time I think about or look at my authentic and perfect Hermès scarf … found in a thrift store for two dollars!